Published in The North West Star, Melissa North. Photo: Melissa North. L-R Cr Jean Ferris, David Stout and Cr Paul Stretton. 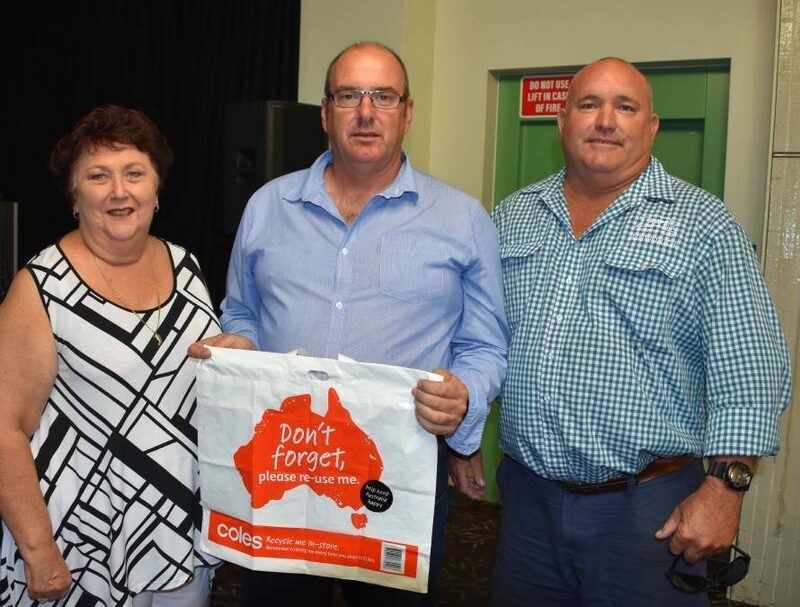 The government will enforce the plastic bag ban in Queensland with hefty fines, a meeting in Mount Isa on Tuesday has heard. The National Retail Association meeting at the Civic Centre attended by local business owners heard the ban targeted lightweight, single-use plastic bags, including biodegradable varieties, but stops short of prohibiting heavier plastic bags. The state-wide ban on lightweight plastic bags comes in on July 1, 2018. It will affect all retailers from grocery stores to fashion boutiques, from convenience stores to fast food outlets. NRA’s Manager of Industry Policy, Research & Projects, David Stout said the ban would be enforced by the Department of Environment and Heritage Protection with fines of more than $6000 per offence. “National chain stores already have strategies organised, so we are targeting the small business and independent store owners,” Mr Stout said. However, he said the government had initiated a transition period to help business owners educate consumers. “The transition period runs from April through to the end of June allowing store owners time to organise options, to access preferred bags and to educate their customers,” he said. Cardboard, paper, woven, fabric and thick plastic bags are preferred options. “The whole thing may seem daunting for retailers, but there are a number options out there,” Mr Stout said. “Business owners just need to choose which bags best suit their merchandise. Councillor and businessman Paul Stretton said at the end of the day the consumer pays or the costs get passed on. “The bag ban is not a bad thing really,” Cr Stretton said.